Joseph C. Campbell, Jr., M.D. Dr. Campbell is originally from the town of Buena Vista, Virginia. He attended college at Washington Lee University in Lexington, Va. and Medical School at the University of Virginia Medical School in Charlottesville, Virginia. He did his residency in Orthopedic Surgery at Bethesda Naval Hospital in Bethesda Maryland. He was a staff Orthopedic Surgeon at Camp Lejune Naval Hospital, Jacksonville, NC 1997-1999. Orthopedic areas includes General Orthopedic Surgery. Special Orthopedic Interests include Sports Medicine, Arthroscopic Surgery, Foot and Ankle surgery. 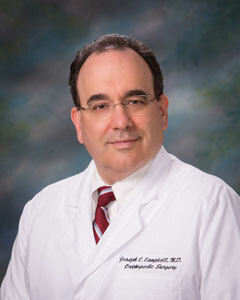 Dr. Campbell is a board certified Orthopedic Surgeon.